Still, Wright encourages Christians to approach social statistics with judicious skepticism: "Just use your common sense," Wright advises. "If a statistic doesn't seem right or doesn't fit with your experience, there's nothing wrong with rejecting it …. [Y]ou have both the ability and the need to critically evaluate statistics." His account of his own discipline is undefensive and down-to-earth: "We have a lot of reasons to be suspicious of social statistics. For one thing, social researchers vary in their ability, and just because someone has a PhD doesn't mean they have done the analyses correctly …. Also, researchers, like all people, have their own biases and preconceptions and these show up in their research …. Finally, we should be suspicious of social statistics because they tend to mutate when they are passed along." Christians, especially those who teach and write and speak, must be careful to "know what they are talking about" when they pass on statistics. Third, for Christians, statistics are descriptive, not prescriptive. While helpful in the decision-making process, statistics do not tell Christians what they should do. The church deliberating under the Scriptures tells us what to do. A statistic which seems to indicate that a Christian response is inadvisable does not mean a Christian should jettison it. As Karl Barth defiantly said in 1933 after Hitler's party had been elected into power in Germany, "The decisive things which I seek to bring to these problems today is to carry on theology, and only theology, now as previously, and as if nothing had happened." In other words, in the tumult of seemingly discouraging events, Christians need not be dissuaded from doing what they know to be right. In Numbers 13-14, ten spies reported that the people in the land were so strong that the people of Israel seemed like grasshoppers. Joshua and Caleb saw the same data but insisted the interpretation by the spies was flawed. The minority faith-full report was vindicated. Fourth, there is a modest apologetic aspect to Wright's book. Wright does not try to persuade people to convert to Christianity. He does not gloss over the many shortcomings he finds in the way Christians think and act. But he does not hesitate to debunk the myths—David Bentley Hart would say delusions— proffered by critics of Christianity. Is it true that "everyone knows" Christianity is dying? 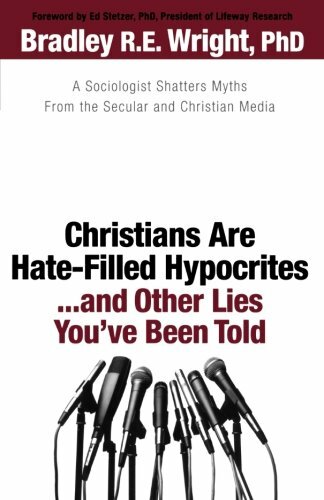 Are Christian claims widely discredited? On the contrary, Wright's findings suggest Christians in the United States need not panic or overhaul everything they are doing. He cheekily includes this summary judgment in the conclusion. "You know, I'm kind of enjoying this oversimplification, so let's take it a step further. That's right, after about a year of reading the scholarly literature and analyzing scores of data sets, I am distilling my evaluation of Evangelical Christianity to a single grade. I give American Evangelical Christianity a B." The reports of Christianity's demise continue to be regularly exaggerated, as Books & Culture readers will be well aware (cf. John G. Stackhouse, Jr.: What Scandal? Whose Conscience? July/August 2007. Jon A. Shields: A Scandal of the Secular Conscience? January/February 2008. Andy Crouch: Transmission Routes: World Christianity and American churches. January/February 2010). What stands in the way of fruitful Christian life? Not massive problems that defy all efforts by Christians, but rather unsurprising obstacles (like institutional bureaucracy and people's penchant for sin), perennial problems that individual Christians and churches empowered by the Holy Spirit continue to faithfully address. Wright wants to help Christians think more sanely about the state of American Christianity. But his modest aim and casual tone belie the gift that he gives the church: an even-handed presentation of the conclusions of the discipline of sociology with a frank admission of its limitations. The reader will be wiser for having read this book. Andy Rowell is a fourth-year Doctor of Theology (ThD) student in Church, Ministry, Missiology, and Evangelism at Duke Divinity School. He has studied the social organization of American religion with Mark Chaves, and has written about church attendance, church growth data, and the use of statistics by pastors at Leadership Journal's Out of Ur blog and the Sociology category of his blog Church Leadership Conversations (www.andyrowell.net).